Emmy Award-winner Kelsey Grammer is Frasier - the hilarious psychiatrist first seen on TV's Cheers and subsequently the star of this smash-hit comedy series. In the complete third season of this acclaimed sitcom, Frasier (Grammer) has encounters with both a woman from his past - Diane Chambers (Shelley Long) - and one in his future, in the form of new radio station manager Kate Costas (Mercedes Ruehl). Niles (David Hyde Pierce) is kicke..
Emmy Award-winner Kelsey Grammer is Frasier - the hilarious psychiatrist first seen on TV's Cheers and subsequently the star of this smash-hit comedy series. Cupid's arrows fly in all directions in Season Four as romantic entanglements include Niles (David Hyde Pierce) and Daphne (Jane Leeves) as well as Martin (John Mahoney) and Sherry (Emmy-nominated guest star Marsha Mason). Frasier's scorecard is even more impressive: Frasier and a ..
Emmy Award-winner Kelsey Grammer is Frasier - the hilarious psychiatrist first seen on TV's Cheers and subsequently the star of this smash-hit comedy series. 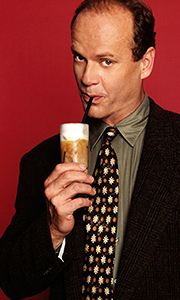 Sibling rivalry between Fraiser and Niles (David Hyde Pierce) leads to some riotous cases of one-upsmanship in season five. Which of the two will find their father Martin (John Mahoney) the better birthday gift? Have an actual day named after them? And come out the winner as they v..
Frasier - The Entire Collection Season 1 To 11 DVD.. Seven festive episodes from the popular US comedy series, Frasier.EPISODES: Miracle On Third Or Fourth Street - Season 1 Frasier Grinch - Season 3 Perspectives On Christmas - Season 5 Merry Christmas, Mrs Moskowitz - Season 6 The Fight Before Christmas - Season 7 Mary Christmas - Season 8 We Two Kings – Season 10..
Own Frasier - Fan Favorites - The Best Of Frasier DVD from Deff, DVD, Blu-Ray & 4K Video Specialists - Free UK Delivery..
Own Frasier Season 1 DVD from Deff, DVD, Blu-Ray & 4K Video Specialists - Free UK Delivery..
Emmy Award-winner Kelsey Grammer is Frasier - the hilarious psychiatrist first seen on TV`s Cheers and subsequently the star of this smash-hit comedy series. In Season Ten, Frasier`s confrontation with an annoying stock market analyst at KACL results in the entire staff having to attend a sexual harassment seminar. Then Frasier`s ex-wife Lilith shows up in Seattle with a plan to have another child - by Frasier! Roz (Peri Gilpin) prepare..
Emmy Award-winner Kelsey Grammer is Frasier - the hilarious psychiatrist first seen on TVs Cheers and subsequently the star of this smash-hit comedy series. The gan's all here for the second season of this wry and witty sitcom - and what a season it is! Frasier Crane (Grammer) infuriates the entire city of Seattle when he complains about its rainy climate during his radio talk show. Meanwhile, his father Martin (John Maloney) finds hi..
Emmy Award-winner Kelsey Grammer is Frasier - the hilarious psychiatrist first seen on TV's Cheers and subsequently the star of this smash-hit comedy series. What?! Frasier Crane, unemployed? Yep, that's the stunning predicament in Season Six when KACL switches its format to “salsa” and Frasier finds himself out of a job! Meanwhile, Niles (David Hyde Pierce) finds himself without a secret love to obsess over when Daphne (Jane Leeves) is..
Emmy Award-winner Kelsey Grammer is Frasier - the hilarious psychiatrist first seen on TV's Cheers and subsequently the star of this smash-hit comedy series. In Season 8, wedding bells chime a sour note when Daphne (Jane Leeves) flees her marriage ceremony to run off with Niles (David Hyde Pierce), and the two lovebirds – as well as a hapless Frasier – ultimately find themselves embroiled in a lawsuit as a result of the marital mayhem! ..